Early-bird deadline: Sept 1. Second price hike at Sept 25th. 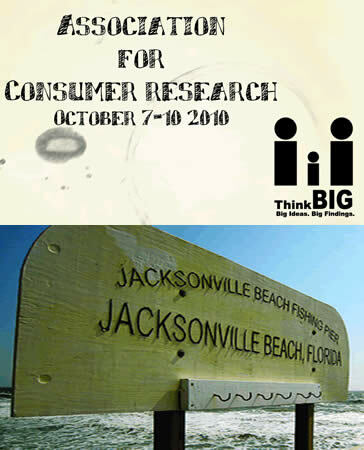 ACR 2010 Jacksonville is open for registration! You will have the option to opt out of the complete program given at the conference. You can build your own program on the ACR website by going to www.acrweb.org/acr and signing in. Once there, choose the “program” option, and you will see the new tool which you can utilize. Print your customized program and bring it with you! The default meal is vegetarian. You will have the option to opt out of the vegetarian meal. You will have the option of buying carbon offsets for your flight. You can choose the electronic version of the proceedings instead of a hardcover copy and receive a $20 discount. The discount for the e-proceedings seems like a classic incentive. Decision Science News just registered and found that they used no default (forced choice) for this question. They could have made the default the green one and said “hardcover available for an extra $20”. In any case, we are glad to see research put to use. ACR 2010 Jacksonville uses green defaults was written on August 5, 2010 and filed in Conferences,SJDM.